I think this outfit of the day is confirmation, as if any was needed, that I am a very Zara-loyal person. My top, trousers, blazer and even shoes are from this store, collected over various seasons both past and present, and then all jumbled together in today's morning rush. This is a very unoriginal move but I wouldn't exactly deem my "style" as anything else. White top of some description? Trousers made of a light fabric? Blazer - this time with some shoulder pads to make me feel 80s? Massive shades to hide behind? Check, check, check, check and check. Whilst my outfit was standard fayre, I did at least try something new with my makeup. I left a meeting last night and had to walk through Dubai Mall to get a taxi. Now strictly speaking I didn't have to walk into the beauty hall within Bloomingdales and head to the Laura Mercier counter - a place nowhere near a taxi rank - but I did. This was all triggered by a conversation I had with Simone the previous evening. She swears by Silk Creme and I have heard the buzz, both positive and negative, surrounding it and I thought I would try it for myself. Whilst I was at it and dealing with a semi-pleasant sales assistant, I also picked up some non-essential items including Brigitte lipstick and (not pictured) Lush Nectarine blush. The Silk Creme has only been on my face a day but I have enjoyed it. I was lucky with the colour match I think because the range is extremely limited. The coverage is on the fuller side but it didn't look cakey after 8 hours of wear. I think it has something to do with the Chanel primer and powder I am now using - that's a combination I have to review if only to pay homage to the wonder that is Les Beiges. How have I lived without this stuff? I really want to try the silk creme foundation! I use her oil free tinted moisturizer, and I'm obsessed! ok now I totally need les beiges! damn you!!! the silk cream is one of my go-tos, I have been loving tarte's amazonian clay one a bit more lately - equally as full coverage but a bit more moisturizing! great picks and love your outfit as always!! I want to try that foundation now! I've recently fallen in love with "stupidly heavy bags" too (probably b/c of your blog) and recently purchased a Kooba Zoey Shoulder Bag..I lovingly blame you, Laura! If it ain't broke, don't fix it! Looking as glamorous as ever! loving your outfit girl! especially that blazer! I absolutely adore this outfit. I may have to make the jump to Zara from H&M which is my current obsession and I too could easily accidentally end up dressed head to toe from that store. lol from a fellow beauty addict, i completley understand the need to 'bypass' the beauty hall on the way to a taxi. this makes sense to me! Follow my Fashion Blog on Bloglovin! I just wanted to say, thank you. I love your blog and also loved the youtube channel which I was faithful with. I hope someday you return to youtube. I know many many people miss you. I love how lovingly honest, simple and beautiful you are and it transmits in your post/blog and in the past through youtube. I love this outfit! So chic and classy :) And don't you love good makeup finds? Love the simplicity of this outfit. You can never go wrong with Zara, I absolutely love the brand. I love your outfit. Simple and elegant. I love your outfit & also want to invest in a navy blazer. I love how any outfit can be made chic with a simple black blazer. It's a wardrobe staple! 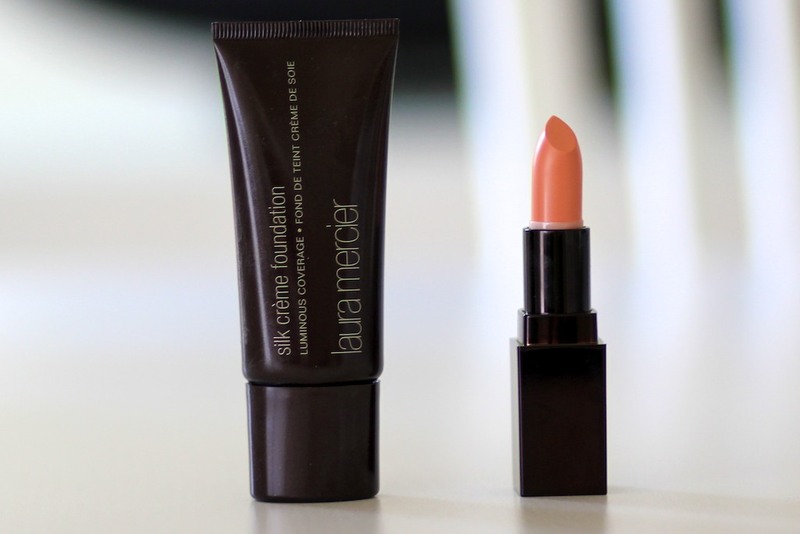 To say the silk creme is such a blogger favourite I've still yet to try it! Such a classic look. The pants look amazing on you. Ah I love this outfit post! I'm desperate to try out Laura Mercier too. I love you blog Laura! Olá! Chamo-me Wendy e adivinhe...também tenho um blog. Um dos meus objectivos para este ano era chegar aos 300 seguidores e para que tudo seja justo, pensei: eu deixo o link do meu blog ( http://theotherprincess.blogspot.pt) se quiser seguir, siga, e se quiser que eu siga de volte, avise! I love your outfit! I'm also obsessed with not only Zara but blazers. I love them! They instantly make an outfit look smart. You're going to LOVE the Lush Nectarine blush. It's one of my favorites! It's funny how you only notice just how much you love a brand when you've styled an entire head to toe look and everything's from the same store! Nothing wrong with brand loyalty, especially with Zara. They always deliver! Love your dressing sense !! Great outfit. Zara sells such classy items. I love simple outfits and this one's fab! You've got to love Zara! Love the outfit! Silk Crème is on my wish list.. I've heard nothing but positive reviews about it. Enjoy. Love your style, this outfit is so chic. Seeing a black blazer always reminds me of the 6th form school uniform which was formal/smart i.e wear a blazer at all time. Like you, I was always rushing in the morning but I never managed to pull of such an effortless, cool look. Your outfit would've passed the school uniform rules and the style test! If it ain't broke don't fix it right? I love your style, it's polished but not too over done. Perfect! Very beautiful and classic! Love! Aside from the blazer, I absolutely love your sunglasses!! Hello Jane thanks for sharing this commentluv search engine actually its superior.